Updated High Confidence Information Private equity firm data and private Investor ages rapidly. Venture capital firms change focus, investment criteria, management, and even their names faster than organizations in any other sector of the financial industry. Thus, no matter when you purchase the 2016 Directory, you can be certain that the information and contacts contained within are the most up-to-date and high confidence available from any source. SECRET INVESTORS Find Hard to find "SECRET INVESTORS" who don't advertise their service, only inside! With the purchase of the printed version 1- 5 you are eligible for the reduced Complete Excel version 2016 for only 49, 90EUR. Normal price 149, 90 USD. SECRET INVESTORS Find Hard to find "SECRET INVESTORS" who don't advertise their service, only inside!You will get access to thousands of investors and over $2,6 TRILLION in active funds! IAC Society established 1992 in the Rep. of Seychelles. Since 1998 IAC publish the International Private Venture Capital Index in Cooperation with 12 leading Offshore Banks. 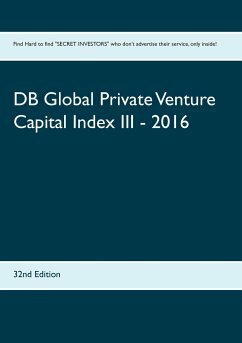 IPVCI has been first created by international Investment Bankers back in Geneva, Switzerland Since 1992 the IPVCI is published by IAC Society and the only daily updated Venture Capital Index by Investment bankers. The IPVCI is also available as Excel format.